This book moves beyond identifying problems to demonstrate proven methods and models that solve multiple, complex problems in concert. 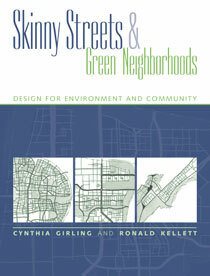 With innovative ideas and practical advice, Skinny Streets and Green Neighborhoods is a guide for today's planners, architects, engineers, and developers to design better neighborhoods and a more natural metropolis. Daniel Burden, Senior Urban Designer and Director of Walkable Communities, Inc.